Today has been a really productive day. I got up at around 12pm (yes, I love my bed on the weekends) but I still made it to the gym, wrapped most of the presents for my friends and family and cooked a yummy dinner! 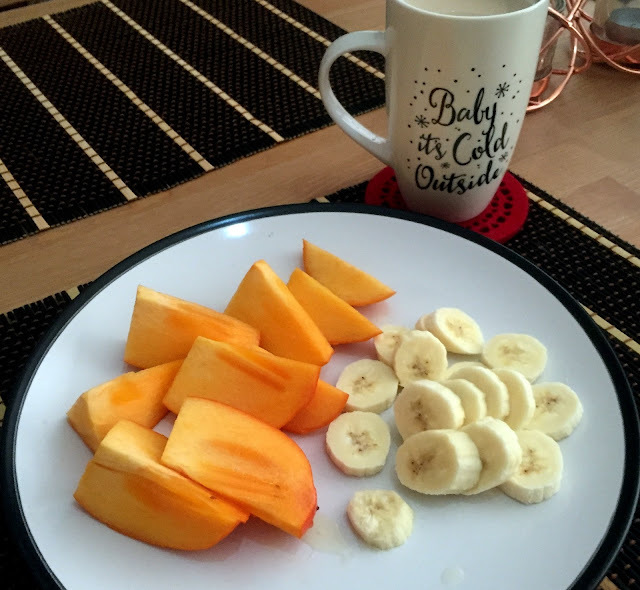 I had a quick fruity breakfast/lunch before I headed off to the gym. I am such a big fan of persimmons at the moment but am trying not to eat it every day, as it is quite high in sugar. I added a bit of lemon juice to my fruit and had some tea next to it. After the gym, I decided to have a quick post-workout meal before dinner, so I bought some red onion and chive bagles from my the supermarket. I had a full jar of peanut butter sitting in the cupboard, so I decided to experiment a little. I've never had bagels before nor have I ever had peanut butter unless I was baking with it. 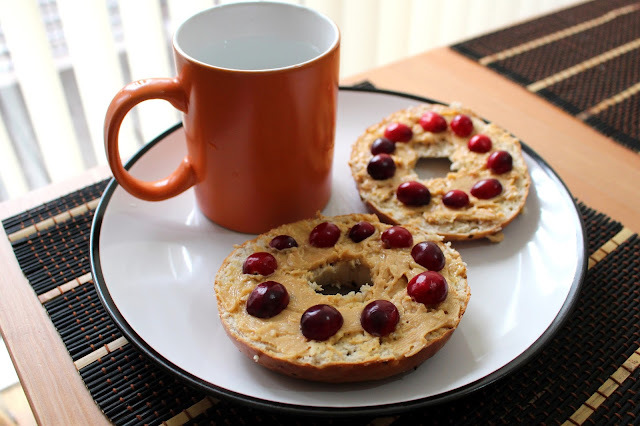 Surprisingly, it was actually quite enjoyable - I think topping my peanut butter bagels with fresh cranberries helped a lot to take a away the dry and thick texture. 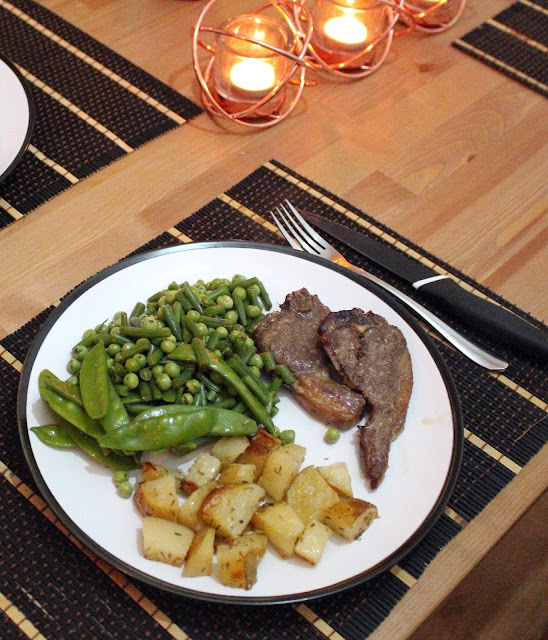 For our dinner Tristan and I oven cooked some potatoes and lamb chops. I had a big serving of green salad as a side - fresh garden peas, mangetout peas and trimmed green beans made such a great combo! 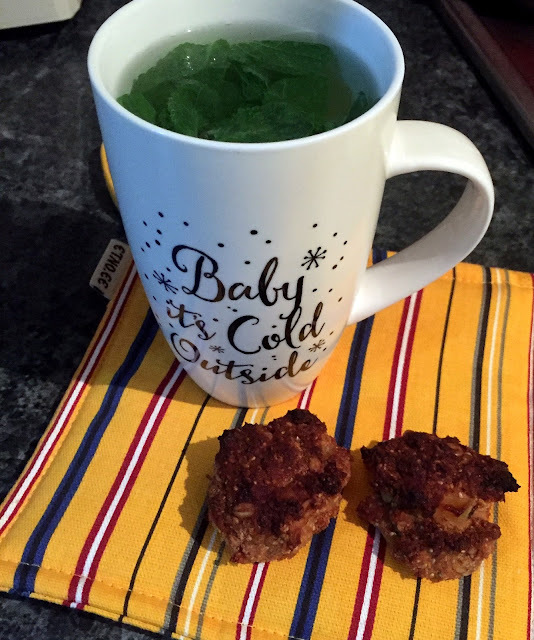 I grabbed some fresh mint from the shop today and made homemade pepermint tea. I love tea and cookies. These are homemade too (chia seed and apple cookies), so I can go to sleep guilt free! In a few minutes these leaves will slowly sink to the bottom of the cup - so no need for a tea infuser! I can also proudly admit that I haven't been snacking between my meals! I hope the next week will be as good as today. Yummm this all looks so good! If I did this kind of a post it would be horrifying haha like "I ate pieces of salami, some popcorn and a butterfinger" haha I need to get better about eating real meals!